On July 19, 1937, the “Degenerate Art” exhibition opened in the Hofgarten arcades of Munich’s Residenz. It included 650 works of art confiscated from 32 German museums. For the National Socialists, the term “degenerate” applied to any type of art that was incompatible with their ideology or propaganda. Whole movements were labeled as such, including Expressionism, Impressionism, Dada, New Objectivity, Surrealism, Cubism, and Fauvism, among others. Many of Germany’s most talented and innovative artists suffered official defamation: for example, George Grosz, Ernst Ludwig Kirchner, Max Ernst, Karl Schmidt-Rottluff, Max Pechstein, Paul Klee, and Ernst Barlach. Avant-garde artists and museum directors who purchased or exhibited modern art had already been barred from professional activity as early as 1933. With this exhibition, the visual arts were forced into complete submission to censorship and National Socialist “coordination” [Gleichschaltung]. Initiated by Minster of Propaganda Joseph Goebbels and President of the Reich Chamber of the Visual Arts Adolf Ziegler (1892-1959), the exhibition travelled to twelve other cities from 1937 to 1941. In all, the show drew more than 3 million visitors. The exhibition sought to demonstrate the “degeneration” of artworks by placing them alongside drawings by and photographs of people with intellectual and physical disabilities. These comparisons aimed to highlight the “diseased,” “Jewish-Bolshevist,” and inferior character of these artworks and to warn of an impending “cultural decline.” As an exercise in contrast, the opposite – good, “healthy,” “German” art – could be seen in the “Great German Art Exhibition,” on view only a few meters away. 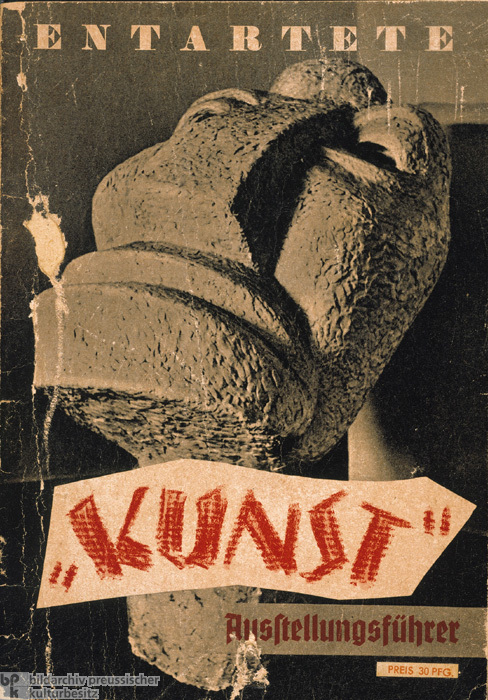 Below is the cover of the guidebook to the "Degenerate Art" exhibition; the cover features Otto Freundlich's monumental sculpture, Der neue Mensch [The New Man] (1912), which had been confiscated from the Museum für Kunst und Gewerbe in Hamburg. Freundlich, a German painter and sculptor of Jewish origin, spent much of his career in France. He was arrested in Nazi-occupied France in February 1943 and sent to the Majdanek concentration camp in Lublin (Poland), where he was murdered on March 3, 1943.